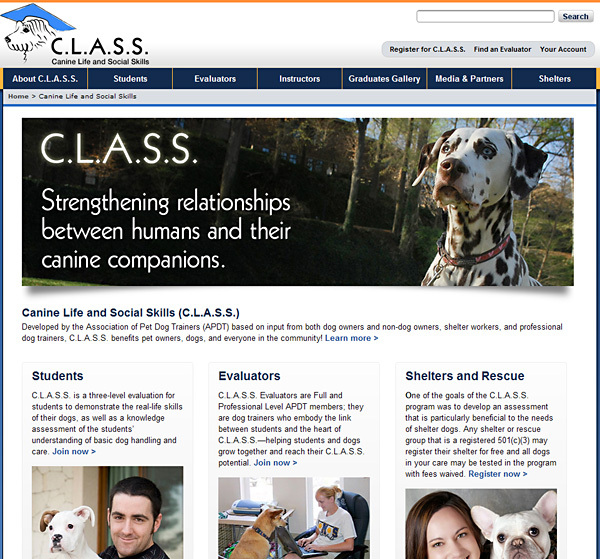 C.L.A.S.S., or Canine Life and Social Skills, is an educational program to promote training focused on the use of positive reinforcement and to strengthen relationships between humans and their canine companions. We decided to use a large, bold, and rotating image, crisp blue and orange colors, and created the site in HTML 5. We wanted the web site to have a very clean look! We also ensured that this web site is fully Web Standards compliant, as well as contains fast-loading pages. A two and three-column fixed, centered design was used and is controlled completely by CSS technology. All pages are automatically printer-friendly with no need to obtain a 'Printer-Friendly Version'. The entire web site was developed using the Microsoft .NET framework and utilizes the latest in page speed optimization. Easy access to both public and Evaluator/Student/Instructor sections. SQL Server 2008 used to manage all site database requirements. Extensive video exams on rotating basis, with full display capability in almost all internet-enabled mobile devices, including iPhone/iPad, Android, and other common PDAs. The fact that a student can register, enroll in the university, and take all the written and video exams on an iPhone while at, say, the beach. College has come a long way, baby! Canine Life and Social Skills was our most fun and most complex web site to produce to date. And we learned more about positive reinforcement and dogs than we ever thought possible!